Todd Marchant is well-known within hockey circles for his speed as he tears down the ice-lanes in NHL rinks. 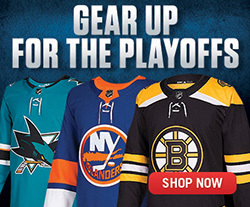 During his time with the Stanley Cup, he tore it up again, only in a distinctly different manner. At noon on Tuesday, July 3, the Stanley Cup arrived at the Marchant home in Williamsville, New York, ten minutes outside of Buffalo, ready for another in a string of unique and exciting celebrations. Although the purpose of the visit was to honour Todd's contributions to the Anaheim Ducks during their inaugural Stanley Cup victory, Todd's wife Caroline was celebrating her birthday and the couple was days away from their tenth wedding anniversary, so with children Lillian, Ashley and Timothy, the family had planned a couple of exciting days. Todd gets anxious. He can never sit down. Whether it's in the dressing room before a game or waiting for the Cup to arrive, the speedy winger is in a state of perpetual motion. As the Stanley Cup pulled into his driveway, he was busy setting up inflatable jumping castles for the kids. A massive tent was also set up in the yard, with tables and chairs neatly arranged and inflated balloons in the black, gold, orange and white colours of the Ducks. Fifty or so guests arrived, children included, just after five o'clock. The kids splash about in the pool, their parents scattered around the perimeter of the pool, keeping a keen eye on the children while enjoying drinks, pizza and wings (chicken, not duck!). A firepit near the pool was in full service, too. Most of the guests were in from the Columbus area, including former teammate Andrew Cassels. After ten seasons flying down the wing for Edmonton, Todd enjoyed playing with the Blue Jackets in 2003-04 and at the start of the 2005-06 season before he was claimed on waivers by the Ducks on November 21, 2005. The guests milled about, enjoying the Stanley Cup celebration, then surprised Caroline by singing 'Happy Birthday.' 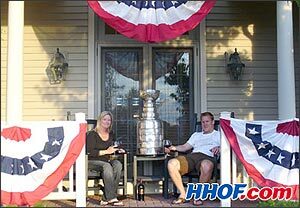 The party continued until midnight, when it wound down, allowing Todd and Caroline to take the Stanley Cup to bed. The Fourth of July is special to all Americans, but as you might imagine, Williamsville had an additional reason to celebrate on this date. Their local hero had the Stanley Cup in town for a second day. In the morning, while the rain came down in sheets, the Marchant kids excitedly ate their Cheerios out of the world's most special cereal bowl. At noon, once the Cup was thoroughly cleaned, Todd took the trophy over to the Amherst Pepsi Center. An invitation-only group received autographed photos of the Ducks' forward and had their pictures taken with Todd and the Stanley Cup. Although only 150 invitations were extended, no one was particularly surprised when double that number showed up for the exclusive opportunity to see the Stanley Cup. 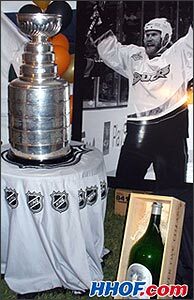 The Stanley Cup sits in front of one of the many photos of Marchant's hockey life blown up in his backyard Cup celebration party. Back at the Marchant's Williamsville home, a professional photographer was set to take portraits of the family with the Stanley Cup. Todd's brother, Terry, who played most of last season with the Fort Wayne Komets of the United Hockey League (now renamed the International Hockey League) arrived to join the festivities. 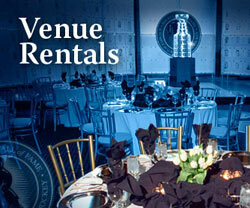 The entire family was dressed in black for the formal photographs with Lord Stanley's legacy. Around the yard, as a second consecutive day of celebration was unfolding, the worried faces of earlier in the day gave way to smiles as the rain tapered off just about this time. Todd looked around his property and saw photos of his hockey life blown up, including action shots and photos of himself on the ice during the Stanley Cup presentation. The menu was a little more formal this time -- crabcakes, chicken and shrimp hors d'oeuvres were served, while a terrific buffet of chicken, beef and salads was laid out for guests. Todd himself is quite a cook, and his famous sausage and tomato dumplings were also on the menu. Although the entrees were outstanding, the kids seemed to be glued to the dessert table. No wonder! Snickers pie, bowls of candy and chocolate chip cookies were there in bountiful supply. The piñata modeled after Todd Marchant during the playoffs sitting atop the Stanley Cup. A disc jockey had not only set up his sound system, but a dancefloor, too. It was well utilized by those attending the Stanley Cup party. It seemed that everyone there belted out Queen's 'We Are the Champions' as it came up on the playlist! As the revellers roared the refrain, glasses of excellent Silver Oak 1983 Napa Valley Cabernet Sauvignon were distributed. Just before midnight, a piñata was brought out, full of surprises. But this piñata was an even bigger surprise! 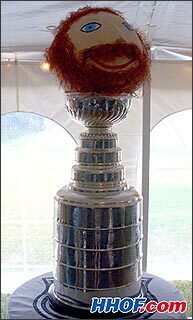 It was made to look like Todd Marchant during the playoffs, including his bright red hair and his playoff beard and moustache. Everyone roared when it was hung in the yard! Two days of wonderful celebrations drew to a close just after midnight. Todd Marchant, who will go into his fourteenth NHL season this fall, had gone 891 regular season NHL games before finally tasting a Stanley Cup victory, and will be back to assist the Stanley Cup champion Ducks defend their title. Join the Stanley Cup Journal on Tuesday, when rookie Drew Miller spends the day in East Lansing, Michigan with the greatest of all hockey prizes -- the Stanley Cup!